Langrenus (132 km wide and a max depth of 4.9 km) is just another Copernicus-style impact crater, or so it looks. 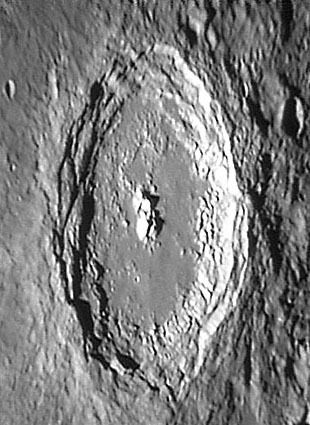 Wreathed in wall terraces, and possessing a central peak complex and partly flat floor, Langrenus is Copernicus-East. Originally thought to be Copernican (LPOD Feb. 23) in age (i.e. 1.1 b.y. or younger) because of its faint rays (LPOD Apr. 16), crater counts show that it is late Eratosthenian, probably 1-2 b.y. old. It has also been stated as being the largest crater formed in the last 3.2 b.y., but Hausen (LPOD Apr. 9) is 167 km in diameter and is also Eratosthenian. So what is left for poor Langrenus? Well, for one thing it is one of only seven craters known to have troctolite within its central peaks. Troctolite is a highlands rock type combining about equal parts olivine and plagioclase. It forms when a magnesium-rich magma remelts and assimilates highland anorthosite and cools, probably near the bottom of the lunar crust. The second unusual aspect of Langrenus is that it is the site of one of the best documented lunar transient events. The experienced French astronomer Audouin Dollfus discovered that the northern floor of Langrenus temporarily brightened when seen in polarized light on December 30, 1992 and January 2, 1993. Dollfus' interpretation was that the bright polarized areas were produced by outgassing that lifted dust above the crater floor. This is a peculiar, but well-documented observation, and is made more believable by enhanced concentrations of radon at Langrenus and nearby Fecunditatis detected during Apollo 15 and 16 missions. Perhaps the fact that the central peaks of Langrenus sampled deep crustal rocks has some connection to the proposed degassing. Have any additional polarimetric brightenings occurred since 1973? Has anyone looked? It is now within the capability of amateur imagers! Sept 12, 2003. 10" f/6 Newtonian plus 5x barlow plus Philips Toucam Pro, 130 frames stacked. Seeing 4/10, transparency 5/10. Tomorrow's LPOD: Elger's Journal - or Goodacre's? This page was last modified on 19 April 2015, at 01:04.